Lactobacillus delbrueckii subsp. bulgaricus is a gram-positive bacterium that has been named after Bulgaria, the country where it was first used to make yogurt by Bulgars (a nomadic tribe, also known as the proto-Bulgarians). 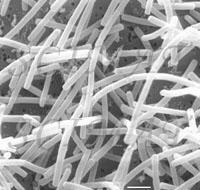 This bacterium thrives freely on the Balkan Peninsula and along with Streptococcus salivarius subsp. 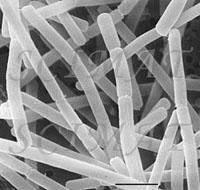 thermophilus is best known for its role in yogurt manufacture. Both are part of a group of lactic acid bacteria which metabolize lactose and produce lactic acid. The slow production of acid lowers pH of the milk and causes the casein micelles to coagulate and to form a gel. Foods produced from milk using microorganisms are called cultured dairy products and cheese. The presence of L. bulgaricus in the human gastrointestinal tract helps to maintain a healthy intestinal microflora. (The correct plural for "bacillus" is "bacilli", thus also "lactobacilli").